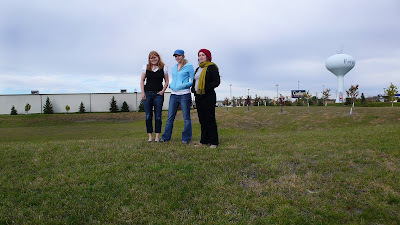 Last month, when we visited Fargo and spoke with three women who worked for the only abortion clinic in North Dakota, the presidential elections had not yet been decided. One of the central issues defining the cultural war--and the difference between a McCain and an Obama administration--is the issue of choice. The women who worked at Red River Women's Clinic told us that the topic is especially sensitive in the Dakotas; although there is a strong pro-choice voice, much of North and South Dakota is vehemently pro-life. Billboards like the one below (just west of Sioux Falls) weren't unusual to spot on the side of the road. We checked back in with two of these ladies and asked them their predictions and hopes for a pro-choice, Obama presidency. They both seemed excited and hopeful. "It would be more than fair to say that all of our staff (and probably a majority of our patients) are glad to see our choice more secure with Obama as president. I have always been proud to work at the RRWC and being connected to our community, but it is frustrating to see legislation, ND, and our country move towards conservative values that leaves women with an unwanted pregnancies and people in other situations without control over their lives. Obama gives a me peace that we have a leader that I can trust and be excited about." planning...The citizens in the United States spoke loudly and clearly with the election of a pro-choice president and the defeat of anti-choice legislation in two states. With these positive changes now is the time to keep that momentum going." Read the rest of Dena's article here.